Nola’s is a Swiss restaurant, so it’s only fitting that its massive outdoor terrace looks like one you might find up in the Alps. 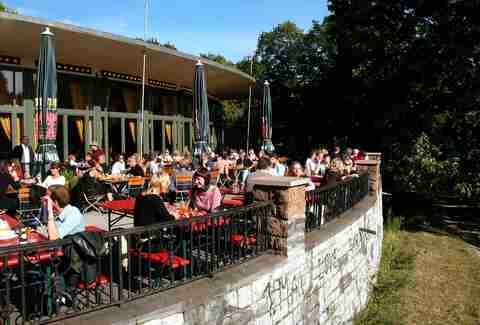 Overlooking Weinbergspark, it’s the perfect summer hangout for indulging in cheese fondue, wine… and OK, maybe a shot (or two) of Swiss schnapps. This venue -- headed up by the indie rock radio station FluxFM -- is known for holding concerts, pop-up dinners, and all kinds of other events. 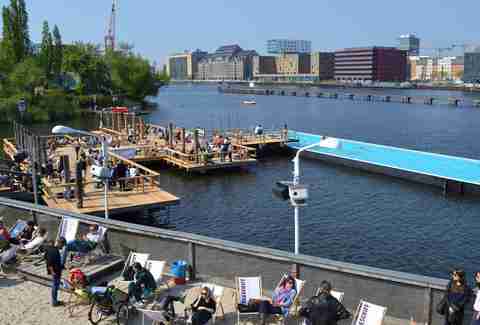 Its terrace is located directly on the Spree, opposite the East Side Gallery (aka the Berlin Wall). 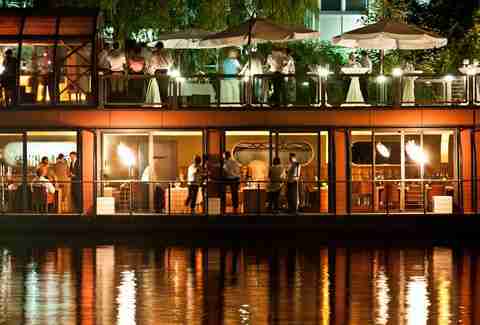 With a swimming pool and sandy beach bar right on the Spree, Badeschiff is an essential summer haunt. During the week, there’s plenty of room to lounge around and tan, but you’ll often find DJs and dance parties here, too. Starting in June, there’ll also be yoga classes twice a week on the sundeck. Club der Visionäre’s rustic vibe, forged from wooden planks and fairy lights, is what makes it a local clubbing institution. Its patio is right on the water, flanked by the arms of a big ol’ weeping willow. If you’re looking for a bar that can do daytime drinks or all-night debauchery rolled into one, look no further. 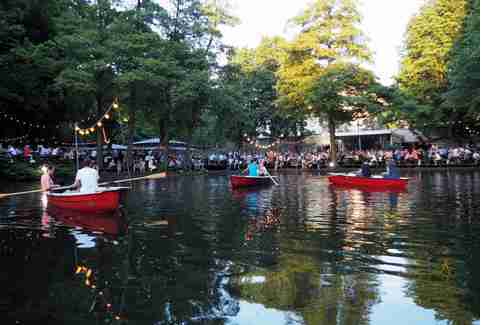 On a large pond in Tiergarten (Berlin’s largest park), Neuen See Café is as close as it gets to a countryside vacation without shelling out for a regional train ticket. You’ll find both tourists and local families here eating Bavarian specialties all season long (try the Flammkuchen, best described as a German pizza). This summer, the restaurant will offer a lengthy BBQ menu on Saturdays, with well-known local chefs manning the burners. Nightclub Salon zur Wilden Renate’s open-air location, ELSE, is just as cool as its year-round mainstay. It’s a wooden clubhouse decked out in vibrant paint, DIY decorations, and of course, a raised deck fitted for dancing (or flailing around). Located underneath the Elsenbrücke Bridge, ELSE gives you a good view of the party riding the S-Bahn between Ostkreuz and Treptower Park. Forget that this place is literally named PATIO for a sec, because it's really a fine Berlin gem. 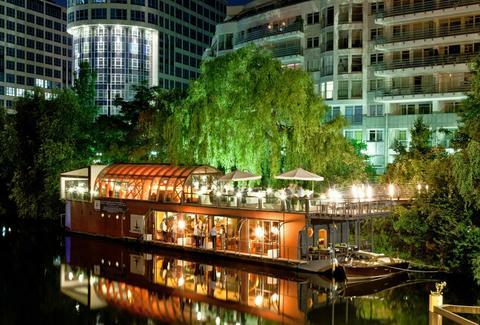 Docked at Bärenbrücke in Moabit, it’s the city’s only restaurant on a ship, with a terrace perfect for evening cocktails. Its fine-dining dishes range from entrecôte to lamb, but there are also veggie options like provincial lasagna or risotto, too. This restaurant is old-world and elegant, just like its namesake, the late German poet and playwright Bertolt Brecht. 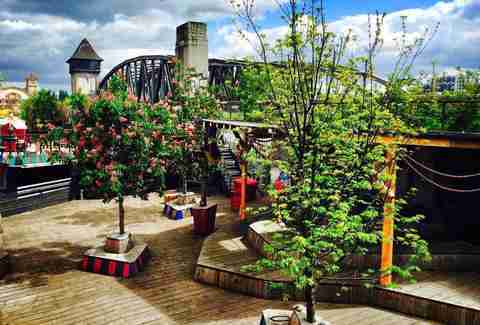 It has a patio on Schiffbauerdamm, the commercial side of Mitte on the Spree, close to major attractions like the Reichstag and Brandenburg Gate. Come hungry, because Brechts serves up a hearty Austrian menu, including the epic jam-slathered pancake, Kaiserschmarrn. Barbara Woolsey is a Berlin-based writer who’s a Kaiserschmarrn expert, courtesy of many Oktoberfests. Follow her on Facebook and Twitter.